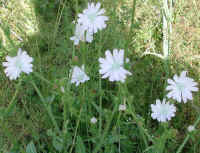 (Chicory, White (Cichorium intybus) - 01) The white chicory is a rare form of the common blue variety, which is part of this photo journal. There is also a rare pink variety. In the spring the dandelion-like leaf cluster at the base of the stems of all varieties of chicory can be harvested for salads or cooked as other greens. Because it's rare, we would suggest that this variety not be harvested. 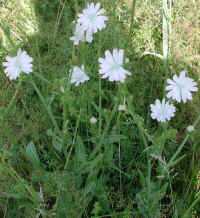 (Chicory, White (Cichorium intybus) - 02) The total absence of color in the white chicory leads us to believe that it's an albino form of the common blue variety, but we could find no such reference in the literature. 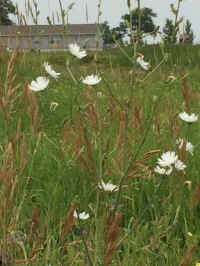 (Chicory, White (Cichorium intybus) - 03) Even the pollen grains are white on the white chicory. We deepened the contrast in this photo so that the stamens could be more easily seen. We encourage our viewers to compare this variety with the common blue variety. This is just another of God's wonders to behold. (Chicory, White (Cichorium intybus) - 04) On 8 Jul 2015, Elena Stahn sent us this photo with our thanks: "I was so happy when I found your site. I saw, today, this white beauty, first time in my life. In Brown City, Michigan. Thank you."